The word Consumerism is featured on the coin in a familiar font, not only paying homage to the commercialization of the holiday, but also holding up a light to a systemic problem. Advertising has taken control of many aspects of our life. وجه العملة هيكل عظمي لبابا نويل يحمل "بطاقة الرقيق" في يده اليمنى وسلسلة في يده اليسرى مع خمسة أسهم على مشبك حزامه والهدايا في الخلفية وكلمة "Consumerism". هيكل عظمي لبابا نويل يحمل "بطاقة الرقيق" في يده اليمنى وسلسلة في يده اليسرى مع خمسة أسهم على مشبك حزامه والهدايا في الخلفية وكلمة "Consumerism". 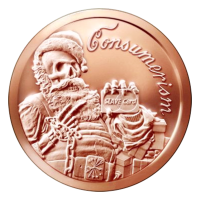 1oz 2015 Consumerism Copper Round There are few things more iconic than Santa Claus and the holiday season. Far from the original message and purpose, the holiday season has now become a time focused almost exclusively on gift giving. With "Black Friday" and "Cyber Monday" sales taking over the nation every year, Consumerism has killed a once beautiful holiday. The design of this round by Heidi Wastweet deals with the embodiment and typification of this obsession with consumption. The skeletonized Santa Claus holds a familiar credit card with words "Slave Card" replacing the brand name and instead of his usual accoutrements he holds a chain of slavery in his right hand and his belt buckle is emblazoned with the five arrows of the Rothschilds family crest. In the background are the presents that once were merely a part of the holiday but now have almost become it's only purpose. The word Consumerism is featured on the coin in a familiar font, not only paying homage to the commercialization of the holiday, but also holding up a light to a systemic problem. Advertising has taken control of many aspects of our life.